In the middle of June, 2014, the Bureau of Land Management (BLM) moved 1,493 wild horses from the Teterville Long Term Holding pastures in Oklahoma to the Beef Belt Feedyard in Scott City, Kansas. Over 13% of these wild horses died at this feedlot. 191 of the wild horses died in less than a year (7/7/14 – 6/30/15). To date, over two years later, the BLM has not made any report available to the public about the Scott City feedlot deaths. Wild Horse Freedom Federation (WHFF) filed a Freedom of Information Act (FOIA) request, and found out that 196 horses died at the Scott City feedlot from 6/17/14 – 8/2/16. 87 of the 196 wild horses were euthanized. 41 wild horses died of colic. Many of these deaths were from sand colic. As late as 4/13/15 (10 months after the wild horses were shipped to this feedlot), local veterinarian Corbin Stevens wrote to BLM’s Joe Stratton “Be sure hay and bunk is free of sand and rocks (try to only throw hay from feed alley into the bunk eliminating road material)” and “A necropsy was performed on one dead horse from pen 2 today and was diagnosed as a colic with small pebbles and sand present in the large colon and cecum.” However, BLM’s FOIA did not provide WHFF with a necropsy report dated 4/13/15. March 24, 2014 – Long Term Pasture contractor for Teterville in Oklahoma (Robert Hughes), gives short notice to the BLM by informing them he decided to renew his existing 5 year contract, but only for a reduced number of horses. He informed the BLM that he wanted to remove 1,900 wild horses (about 1,400 mares and 500 geldings) by June 1, 2014. May 28 (or 27) 2014 – Pat Williams, the WH& B State Lead for New Mexico inspected the Scott City, KS, feedlot for NEPA analysis. Although a working facility with a squeeze (“tilt”) chute was required, the contractor for Scott City, Phil Jennings, didn’t want to install that infrastructure until the contract was signed. Phil Jennings, who was going to lease the Beef Belt feedlot for this emergency contract worth over $2 million, is the contractor for the BLM’s Pauls Valley facility in Oklahoma. June 4, 2014 – BLM signed the contract. BLM’s Zach Reichold was designated as the COR (Contracting Officer’s Representative). June 14, 2014 – BLM began moving wild horses from Teterville Off Range Pasture (long term holding) to Scott City, KS. The BLM crew at Teterville LTH was Scott Fluer, Bea Wade, Richard Williams, Jimmy Galloway and Pat Williams. 3 horses were euthanized before leaving Teterville. The BLM crew at Scott City was Jerome Fox. June 22, 2014 – BLM concluded the transfer of mares to Scott City. July 7, 2014 – Local veterinarian, Dr. Corbin Stevens, states 3 times in a report that less than 2% of horses have a body condition score of 3 or lower. July 17, 2014 – Dean Bolstad discovered there was no squeeze chute or BLM Project Inspector onsite and discussed the need for this with Zach Reichold (the COR). July 25, 2014 – Dean Bolstad informed Greg Shoop that there was no squeeze chute or BLM project inspector onsite at Scott City. July 2014 – 35 wild horses died during this month. August 8, 2014 – BLM issues it’s news release. Aug. 11, 2014 – BLM began “transitioning” Joe Stratton as the COR of Scott City. Aug. 12, 2014 – BLM’s Pat Williams and Al Kane (USDA APHIS veterinarian) arrive at Scott City to perform an inspection. June 19, 2015 – Dr. Stevens informs Joe Stratton that there is a mare with a vaginal growth that appears to be infected and that Naxcel and surgery may be warranted. No freezemark number or description was given. May 17, 2016 and May 19, 2016 – About 2 years after horses were shipped to Scott City, even though the Teterville contractor had given the short notice that lead to this crisis, the BLM ships 5 truckloads of horses BACK TO TETERVILLE. (The BLM started shipping horses out of Scott City after April 25, 2016 (1,311 were there end of month). By end of May, 2016, 576 were there. Shipping records from June 2016 show that more horses from Scott City were shipped to other long term holding pastures. Per BLM’s Dec. 2016 Off Range Facility Reports, Scott City is no longer listed as warehousing any wild horses. Oct. 14, 2016 – AP reporter Dave Philipps writes an article (that reads like a propoganda piece for the BLM), titled “Success Spoils a U.S. Program to Round Up Wild Horses.” This article, filled with misinformation, included a photo of Teterville contractor Robert Hughes, a video of wild horses at Teterville, a quote from BLM’s National Wild Horse & Burro Advisory Board member, Ben Masters (who voted to kill all the wild horses in holding), and a quote from Dean Bolstad, the Wild Horse & Burro Division Chief, stating that “We’re in a real pickle…” (No, Dean, the BLM isn’t “in a real pickle,” the wild horses and burros are “in a real pickle.”) There was no mention in Philipps’ article about what happened to the wild horses from Teterville at Scott City. There were necropsy reports for 24 horses sent in response to our FOIA request for all necropsy reports. One of the necropsy reports did not have a date or time on it, and a couple of them didn’t identify the freezemark numbers of the horses. 8/6/14, 5 p.m. – #4805 – atrophy of fat around heart. Natural causes/old age. Collected blood prior to euthanasia. 8/6/14, 5 p.m. – #2687 – old age. Liver failure. 8/6/14, 5 p.m. – #6404 – natural causes/old age. 8/12/14, 5 p.m. – #020937 – small intestine hemorrhage. Cecum torsion. Colon enlarged and full of feed. Died of colic. 8/12/14, 5 p.m. – #945088 – natural causes. Old age. 8/16/14, 5 p.m. – #6940. Natural causes. Collected blood prior to euthanasia. 8/27/14, 6 p.m. – #8737 – cecum enlarged, displaced. Colic. 9/6/14, 12 p.m. – #05180369 – inflammation around pericardial sac. Died of heart disease/failure. 9/6/14, 12 p.m. – very large, infected coronary arteries. Heart failure. 9/12/14, 6 a.m. – #3675 – small intestine inflamed. Cecum inflamed. Feed material in abdomen. Colic. Ruptured gut. 9/18/14, 5 a.m. – #0041 – colic. 10/20/14, 4:30 p.m. – #7435 – cecum enlarged & hemorrhage (sand). Colic. Twisted gut. 10/21/14, 4:30 p.m. – #1062 – cecum enlarged/hemorrhagic/full of sand. Sand colic. 10/21/14, 4:30 p.m. – #9240 – cecum enlarged/hemorrhagic/full offals. Colic. Impaction. 11/12/14, 5 a.m. – #6761 – bloated. Cecum ½ full of sand. Died of sand colic. 12/15/14, 6 p.m. – #97175205 – bloated, cecum & colon full of feed. Colic. Impaction. 1/13/15, 6 p.m. – “mustang mare” (no ID) – bloated. Colic. 3/11/15, 6 p.m. – #19964528 – ulcers. Bleeding ulcer. 4/17/15, 9:30 a.m. – “grey mare” – bloated. Cecum hemorrhage & inflammation, colon hemorrhage & inflammation – sand. Died of colic. Sand in large intestine. 5/11/15, 12:30 p.m. – #2074 – bcs<3. Unable to maintain weight due to age. 5/20/15, 5:20 a.m. – #8513 – Bloated and cecum full of sand. Died of sand colic. 5/20/? ?, 6 p.m. – #6532 – bcs<3. Unable to maintain condition. No date or time listed for this necropsy – #3756 – heart enlarged and infarcts. Heart failure. By not issuing a report regarding Scott City to the public as promised, or in a timely manner, the BLM seems to just want to sweep what happened at the Scott City feedlot under the rug. Wild Horse Freedom Federation will not ever forget even one wild horse or wild burro that has suffered at the hands of the BLM’s mismanagement. WILD HORSE FREEDOM FEDERATION HAS POSTED FOIA DOCUMENTATION ON SCOTT CITY ON OUR WHFF WEBSITE DOCUMENTS PAGE – CLICK HERE. 75 wild mares died in a very short amount of time at BLM’s emergency short term holding facility in Scott City, Kansas. The BLM awarded the contract for an emergency short term holding facility to Phil Jennings, who has the contract for the BLM’s Pauls Valley facility in Oklahoma. Jennings has had contracts with BLM since 2005 for Pauls Valley, and the obligation amounts seemed to be mostly in about the $100,000 to $300,000 range. The BLM Scott City, KS emergency short term holding facility contract was signed 6/4/2014, and the obligation amount is $2,030,000. Yep, that’s a jump to over $2 million dollars. But Jennings is in Pauls Valley, Oklahoma. That’s about a 400 mile drive to Scott City, Kansas. 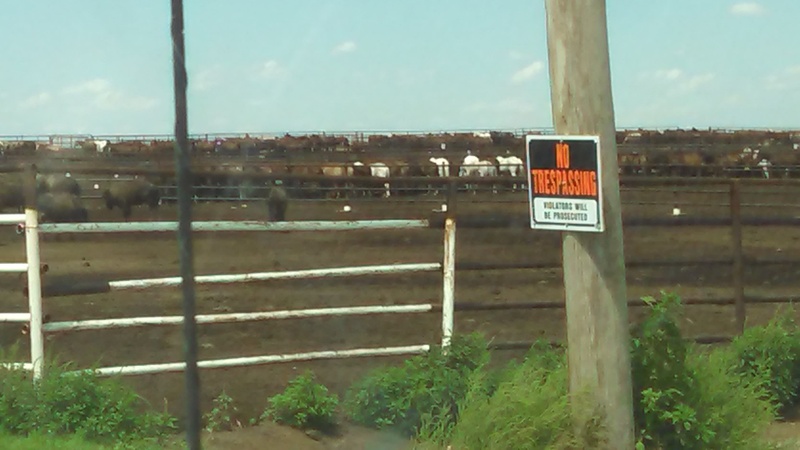 It seems Jennings may have LEASED the feedlot run by Beef Belt, LLC in Scott City, KS. So, in essence, BLM’s contractor hired a subcontractor. If a contractor leases a feedlot from what is in essence a subcontractor, then the subcontractor has no direct contract with instructions and obligations to the BLM, does it? Did any BLM personnel give written instructions and obligations to Beef Belt, LLC, which was formed in 10/1/13 (just 9 months prior to getting this windfall of business)? Or.was it only after 70 horses died, that the BLM finally seemed to get concerned or involved, and give instructions about the feed? You might also recall what I said above about digestion. It came to a screeching halt as soon as the horse was alarmed. Perfect conditions for the development of intestinal compactions and colic-the #1 killer of horses. Again, it is no surprise the BLM reported colics associated with the Calico Complex Gather. course not! Let’s be honest. It has nothing at all to do with the hay and probably little to do with the change of diet. It’s about being scared our of their wits and the sympathetic tone shutting down processes related to appetite and digestion. But these overt consequences are just the tip of the iceberg. Let me explain. Here’s the thing, psychological stress regardless of the source also activates the fight-or-flight reaction. The body doesn’t distinguish between a fight-or-flight situation, like being chased by a helicopter, and a psychological stressor. That means the bad news for wild horses only begins with the gather. There’s the confinement itself. Imagine how stressful confinement in an unfamiliar place must be to a species who depends on running for survival and who instinctively avoids places where they might get trapped. unfamiliar horses. And don’t overlook the importance of such things as the loss of or separation from lifelong herd mates … companions and family. It is egocentric to think such things are only important to our species. So what needs to happen now as Advocates You Need to take the necropsies and file a suit to Stop Roundups based on the High ratio of heart failure possibly due to the helicopter roundups intense stresz and heightened fear responses which lead to painful as well lethal ulcers. These are All caused by Extreme stress. STRESS also causes Colic. These roundups are lethal to horses and often ulcer symptoms are not visually observed if they are Not fatal. Some present with listlessness, off behaviors, drooling, etc. By then they are serious. These horses are put under Extreme Stress and then the housing where they are Forced to live together as often Wild bands break away from other bands and there in holding which disrupts their normal separations from those bands. The handlers are often more worried about their own safety than the health mental and emotional welfare of the horses which directly is linked to All these issues including ulcers, heart conditions and Colic. These are All situations which a allowing the horses to be roaming free prevent. These high numbers are proving these roundups are more dangerous than first realized. While accepted the roundups may be the largest causation of deaths and must cease to provide healthier environment for the horses. And. I WANT to point out. Horses are generally noted to require 1 legal acre of grazing per head of horse. Less if constantly hay fed and excersized properly. However, these horses are contained by the BLM in an area much smaller ie Holding pens than Allowable space with the large numbers as well they also complain about horses overusing grazing lands. If you figure say 50,000 wild horses by average 2 acres each horse then they only Require free roaming 100,000 acres. Now you divide the 100,000 acres by the Entire Public Land Acreage and you have millions of acres more than free roaming horses require. We have to start Calling them out on the Abuse and Lies. JUST straight out. File a suit stating theres more than enough of the American Standard of avreage per horse available as well clarify the massive cattle impact dettremental to the public lands and finally clarify the deaths Are a Direct Result of Stress, Pain, and illness caused by exhaustion, fear, stress, amlnd yes abuse mental emotional and physical vaused by toundups. Colic cannot always be prevented but this LARGE amount of deaths in a short time is very alarming and likely most could have been prevented. Did BLM care? Colic indicates a painful problem in a horse’s abdomen. Horses are naturally prone to colic and many types of colic cannot be prevented. However, there are some relatively simple steps that can be taken to reduce the risk of colic in your horse. 1. Always have fresh, clean water available. When traveling on longer trips, stop to let horses drink and/or have a veterinarian pretreat them with mineral oil before starting. 2. Allow pasture turnout. Horses that have access to pastures have been shown to have a lower colic risk than those without pasture access. 3. Avoid feeding on the ground in sandy areas. Horses may ingest enough sand to irritate their intestines. Feed in tubs or hay racks. Place rubber mats or catch pans underneath racks to enable horses to get the scraps without getting sand. You and I have paid this WH&B holding facility contractor, Phil Jennings, $6,532,062 since 2010. It appears that you and I paid $4,295,660 to have our wild horses at Scott City holding facility – including the hundreds who died in excruciating pain of colic caused by the MIS-mangement of the BLM and the contractor. This includes $2,030,000 that was authorized to pay him on 6/14/2014 for the temporary holding (Scott City) facility and another $872,200 on 6/22/2015 and another $950,000 on 11/30/2015 and another $4,260 on 1/11/2016 and another $439,200 on 5/31/2016 – all for Scott City emergency holding. The balance of the money we paid him is for the Paul’s Valley holding facility – where he STILL TODAY has hundreds of our wild horses under his control.